CBRE South Asia Pvt. 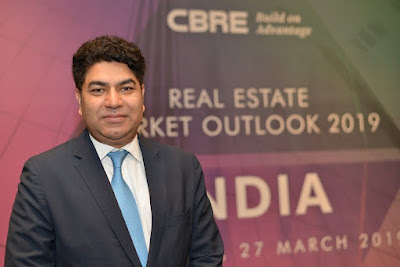 Ltd., India’s leading real estate consulting firm, has announced the findings of its Real Estate Market Outlook 2019 – India. As per the report, India continues to retain its position as the world’s fastest growing major economy, on the back of improved investor confidence and better policy reforms. The IMF’s database also suggested that India’s contribution to world growth has increased from 7.6% during 2000-2008 to 14.5% in 2018. 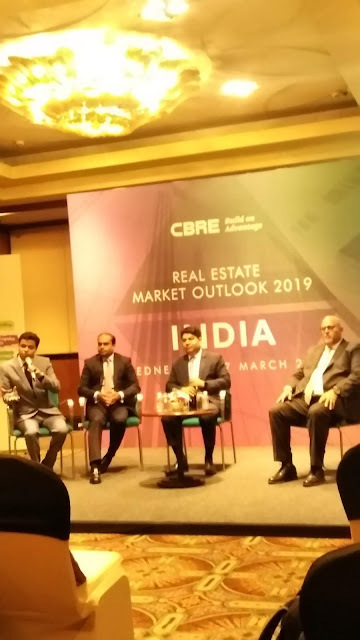 The CBRE report highlights 2019 trends and dynamics across various segments in the real estate sector in India. o Polarisation between cities: Demand and supply would continue to be focused towards the most prominent destinations i.e., Bangalore, Delhi-NCR, Hyderabad and Mumbai. o Greater appetite for SEZ’s/tech parks: With the sunset date of March 2020 fast approaching (which will impact the benefits for occupiers), heightened activity for both absorption and development completions is expected in the SEZ and tech park space in 2019.
o Absorption trends: Leasing activity in the sector will be driven by evolved sources of demand rising interest of global occupiers, workplace changes due to digitization of jobs, evolving need for flexibility, increased demand for domestic needs, rise in net absorption and Core + Flexi workplace strategies. The combination of these sources of demand, coupled with the supply influx of quality space is likely to result in the share of net absorption to rise from the current 60-65% to about 70-75% during 2019-20. The share of tech in overall space take-up in the country will remain in the range of 30 – 35% by the end of 2019.
o Supply trends: We expect development patterns to be more tech-tailored and anticipate a stronger pipeline in 2019. CBRE expects nearly 40 million sq. ft. of new office space to be released over the next twelve months. Almost 30% of this pipeline is expected to be in the SEZ space. There is also expected to be an impetus on “smarter” buildings – driven by the augmented use of tech for optimising space and costs. o Experiential retail and placemaking will be the key, landlords and retailers likely to use tech for studying consumer patterns and enhance customer experience. o Alternate assets such as co-living, student and senior housing will continue to garner greater interest from end users and developers.